I saw lots of signage in Paris that was love-worthy, but this reworking (shall we say) of a Eurostar sign was my favorite. 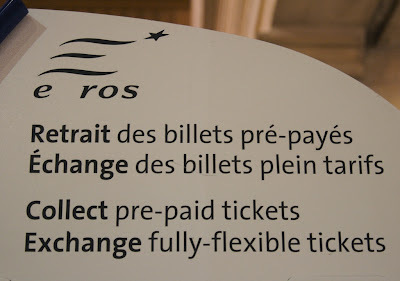 When did tickets for eros get handed out? Was that the day I was home sick from high school or something? Because I tell you--I seem to be short an "admit one" or two. But: just in case I seem to be grousing: it would seem that I am not going to come down with the norovirus right now, for which I am so much more than immensely grateful--not least because it means that I can walk to a neighboring village for a lunch of mussels tomorrow.